If you have never felt the pressure to win or felt like throwing up all over yourself at some point in your life, I would not believe it. The word “choke” is a dirty five-letter word in sport, especially when it leads to failure. No one wants to admit to others that sports anxiety got to them. Every athlete has choked or been anxious at one time or another, if someone says they have never choked or felt like choking at some time, he or she is not being honest. What does “choke” mean? The term comes from the feeling athletes get in their neck when they are under pressure or stress. It feels like you can’t breath or that the air supply is cut off, which is a physical reaction to stress. Choking starts in the mind: the fear of failure, anxiety about losing a game, or a poor focus of attention can bring it on. The mind races: “What if we blow a 10 point lead?” a football player says to himself. When anxiety or fear sets in, this starts a chain of reactions in your body. Your mouth gets dry, your hands sweat, your breathing becomes labored, and you feel like someone is strangling you. During crunch-time—the last two minutes of a game or the final hole of a golf tournament—is when an athlete will either rise to the challenge or crumble from fear. The ability stay confident and focused when the heat is on is a sign of a champion and a key to performing well. Whether it’s an important match or a big game, how you cope during crunch time often separated the winners from the losers. Champion athletes are able to thrive in the last 2 minutes of a tight game because they go deeper in “the zone” while others get distracted and have a meltdown. Why do some athletes fold during crunch-time whereas others thrive on it? It depends on the interpretation of pressure—as a challenge or a threat. A person must see that pressure starts on the inside from your fears, anxiety, or misguided expectations. Here, I offer suggestions for staying composed and being confident during crunch-time. Play Aggressively instead of Tentatively: Many athletes take a defensive approach to their game when they feel the heat. Instead of trying to avoid making mistakes, challenge yourself to perform well and strive for success. Be aggressive instead of tentative. If you try not to throw an interception for example, most likely you will miss the receiver because you are focused on missing. Play Like You Do not Care: When you care too much about winning, you try too hard to make it happen. if you work hard at something your whole life, it’s hard not to care, and care too much. Everybody wants to win, but winning comes from letting yourself perform in the moment without attaching any consequence to the outcome of the game. The Past is Over: Memories from the past can haunt some athletes. Past memories of failure can pop into your head during crunch-time, especially when you have blown a lead or made costly mistakes in the last moments of a game. It becomes a generalization: It’s happened in the past, it might happen again. If you don’t stay grounded in the present, those memories of the past will haunt you. Use the past only if it helps you be confident in the present. Focus on the Process: The fear or anxiety you feel often relates to outcomes such as losing, getting hurt, or blowing a lead. Focusing on outcomes takes your focus away for the task. Great athletes focus on what they can control, which is execution and staying in the present. A pitcher, for example, needs to focus on his set up, visualizing the pitch, and focusing on the target, instead of worrying about what will happen if the batter gets a hit to score the winning run. 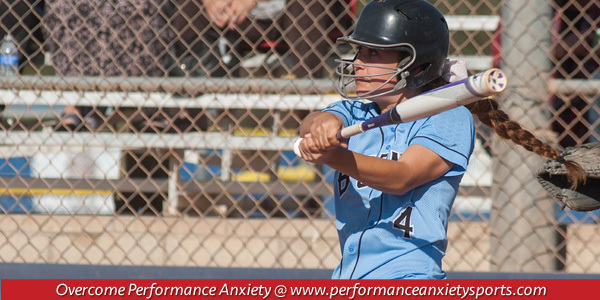 Want more tips to overcome sports performance anxiety? Enroll in our free performance anxiety video course. Please post your challenges with performance anxiety and boxers and we’ll try to post an article for you.